Well, summer is starting to wind down and our journey on the Home30 Challenge is coming close to its end as well. I wanted to do something fun for a recipe and I decided a delicious dessert would be fitting. I have to be honest with you, my recipe didn’t come out quite how I had planned. But, don’t worry because something even more fun and exciting has come from it. My recipe was a bust, but from them my easy and tasty dog biscuits with Philips Airfryer were created! That’s right, what better way to celebrate the Home30 Challenge than with the entire family. And, in our family, that includes all the four legged, furry, finned, feathered, and shelled family members too. I started my dessert recipe as a basic donut batter, but I must have done something wrong because they came out as hard as stones and didn’t taste much better. In case you were wondering, I love to cook, but my kitchen expertise stops there. To summarize, I’m not much of a baker. This recipe for a Dog Snack is super easy and you can really put whatever you want in them to make them tasty and healthy for your furry friends. I made biscuits with dog food, potato, beef flavor, and oatmeal in the batter. I tossed them in a BBQ and coconut oil coating before I cooked them in my Philips Airfryer. They were a total hit with my girls Zoë and Piper and the “old man” of the house, Skittles, too! Here are the ingredients you’ll need, and again, this recipe is super easy and you can really add almost anything you want, just be sure it is safe for your pets to consume. Also, gather your cookie cutters to make some fun designs, believe me, your pets will thank you, even if you think they don’t notice. All the optional ingredients are just ideas, you can add what you like, just be sure it is safe for your pet. Now, let’s get these “puppies” in the Airfryer and cooked! In a large mixing bowl, combine all ingredients (even optional items) and stir until combined fully. Stir into a firm dough, adding liquid and flour as needed for consistency. Roll out dough on a floured surface to about ½ inch thick. In a small mixing bowl, combine coconut oil and BBQ sauce until completely mixed. In small batches, coat the dough biscuits in the oil/BBQ mixture and lay in a single layer in the Airfryer basket. Cook for 3-5 minutes, checking on doneness to gauge cooking time as the cooking time depends on the thickness of your biscuits. 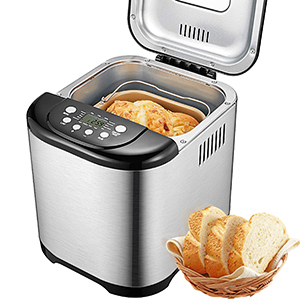 Remove your cooked biscuits from the Airfryer and set out on a cooling rack to cool completely. Once cooled to room temperature, toss on to your furry friends and watch and listen to their excitement and satisfaction with slobber and crunching! These biscuits can be kept at room temperature for about 7 days and if meat is used as an ingredient be sure to refridgerate your biscuits. They can be kept in the fridge for up to 2 weeks, but I don’t think they will last that long! I don’t want to rob you of the dessert recipe that I had in mind, so I want to be sure you finish reading this post with ideas for your four legged friends AND a dessert recipe for your human family members. This recipe can be found in your Philips Airfryer Recipe Book and, like all the recipes, is incredibly tasty and super easy! So, we’ve established that I am not much of a baker, I will leave that to Jenn! But, what could have been a yucky culinary mistake, using my Philips Airfryer, turned into a yummy treat for my best friends on four legs! Our pups absolutely loved the biscuits I made with my Philips Airfryer and since it was so easy I will definitely make more! Also, since I’m in charge of the ingredients that go into them, I can be sure what my dogs are consuming which truly puts my mind at ease!